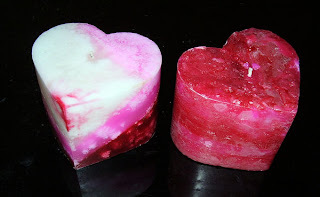 so I have been busy cranking out pink sugar scented heart candles. Here is a picture of 2 of the 10 or so I will be making before valentines day gets here. I will post a picture of more of them once I get them done. One of my clients had a wonderful idea. This year instead of sending out holiday cards, she is sending out valentines day cards to all her friends and family. She added a heart air freshener(cherry kiss, cinnamon and love spell scented) to each of the cards. Put up about 4 new soaps on my website. I have to say the new Island Kola Nut one has been making my house smell wonderful!